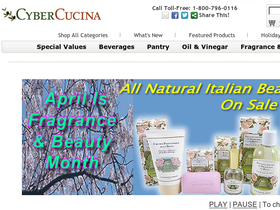 Cyber Cucina, online at CyberCucina.com, is your online source for imported gourmet foods and more. Cucina offers an extremely wide array of gourmet food options with appetizers, beverages, butcher shop, candy & chocolates, children’s, desserts, fragrance & beauty, fruits, jams, chutneys, grilling & barbeque, honey, syrup, toppings, kitchen accessories, olive oil, other oils, olives & olive products, pastas, pate, fish, preserved vegetables, rice, grains, legumes, sauces, seasonings, condiments, spreads, serveware, truffles, mushrooms, and vinegars all available for order. Try all these delicious foods today and remember to check out RetailSteal.com for all the best Cyber Cucina codes, Cyber Cucina promotions, and Cyber Cucina discounts. Cyber Cucina ships via UPS and shipping is free on orders of at least $125. Shipping rates vary based on package weight and destination; Cyber Cucina does ship internationally. See website for exclusions that may apply and details. Shop the clearance section at CyberCucina and save up to 50% off a wide range of food products. Enjoy free shipping at Cyber Cucina when you spend at least $125. Purchase gourmet items in the clearance section at CyberCucina for only $1.99. Shop for sea salts as low as $5.25 at CyberCucina. Buy select chocolate dessert beverages at CyberCucina for only $9.95. Click link to purchase. Buy Hédiard Blend Loose Leaf Tea at CyberCucina for only $15.25. Click link to purchase. Shop at Cyber Cucina to find great gifts for all your loved ones for every occasion. Save 10% on balsamic, wine, flavored vinegar at CyberCucina.com with this code today. Hurry over to efoodsdirect.com and get a $30 discount towards any order with this coupon code.